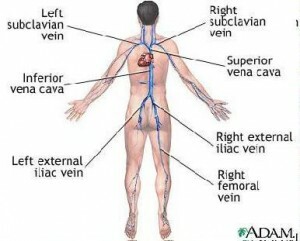 Blood clots may form when something slows or changes the flow of blood in the veins. After a pacemaker catheter has been passed through the vein in the groin. Fractures in the pelvis or legs. Recent surgery (especially hip, knee, or female pelvic surgery). Too many blood cells being made by the bone marrow (polycythemia vera), causing the blood to be thicker and slower than normal. Blood that is more likely to clot (hypercoagulability). These are the iliac veins in the pelvis, the femoral veins in the thighs , the popliteal veins behind the knees and the calf veins. Changes in skin color (redness) in one leg. Increased warmth in one leg. Leg pain in one leg. Leg tenderness in one leg. Skin that feels warm to the touch. Swelling (edema) of one leg. our health care provider will perform a physical exam. The exam may show a red, swollen, or tender leg. Doppler ultrasound exam of the legs. Plethysmography (measurement of blood flow) of the legs. X-rays to show veins in the affected area(venography). Activated protein C resistance (checks for the Factor V Leiden mutation). Genetic testing to look for mutations that make you more likely to develop blood clots, such as the prothrombin G20210A mutation. Lupus anticoagulant or Protein C and protein S levels. Screening for disseminated intravascular coagulation (DIC). Surgery is a rare option in treating large deep venous thrombosis of the leg in patients who cannot take blood thinners or who have developed recurrent blood clots while on anti-coagulant medications. The surgery is usually accompanied by placing an IVC (inferior vena cava) filter to prevent future clots from embolizing to the lung. You will need to get blood tests often to make sure you are taking the right dose. In rare cases, surgery may be needed if medicines do not work. Placement of a filter in the body’s largest vein to prevent blood clots from traveling to the lungs. 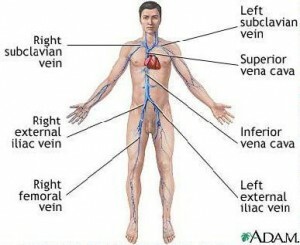 Removal of a large blood clot from the vein or injection of clot-busting medicines. If you have symptoms of DVT. Do not smoke. If you smoke, quit. Women who are taking birth control pills or estrogen must stop smoking.